Did you know that apple cider vinegar is so much more than as salad dressing? It is effective for your skin, health, weight loss, and your hair. Apple cider vinegar has powerful healing compounds, which include acetic acid, magnesium, potassium, probiotics, and enzymes. Acetic acid helps to kill “bad” bacteria and at the same time growth of “good” bacteria in the body. It act as natural antibiotic, to provide numerous benefits related to skin, digestion, support weight loss, and your hair without any side effects. Here are top 5 awesome and creative ways to add the benefits of ACV in your routine, and let me know if you have any other creative uses! Combine 1/2 tablespoon apple cider vinegar with 1/2 cup of water and mix them well. Apply it on clean skin using the cotton ball or pad, avoiding the eye area. 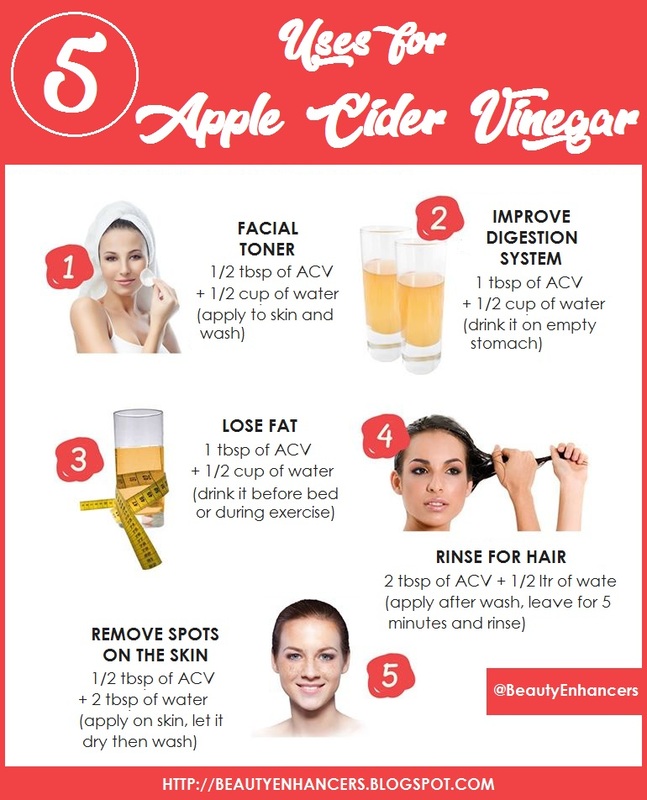 Rinse your skin after the apple cider vinegar toner has dried. Store the remaining solution in the bottle and place it cool and dark place, shake well before each use. Mix 1 tablespoon apple cider vinegar with 1/2 cup of water. Mix 1 tablespoon of apple cider vinegar with 1/2 cup of water. Consume it daily before sleep or consume it during exercise. Mix 2 tablespoons of apple cider vinegar with 1/2 liter of water. Use to douse your hair after washing, leave it for at least 5 minutes and then rinse it off. Mix 1/2 tablespoon of apple cider vinegar with 2 tablespoons of water. Apply it on your skin, let it completely dry then wash. Follow it regularly 2 times in a day.